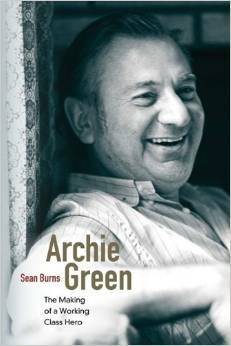 I knew Archie Green during the extraordinarily productive final third of his long, busy life. I believe I initially met Archie, along with Bob Cantwell and Ralph Rinzler, at the Sounds of the South conference in Chapel Hill in 1988. The Folk Alliance office I ran happened by be located in the Southern Folklife Collection at UNC’s Wilson Library just as Archie was arranging for the John Edwards Memorial Collection to be moved there from UCLA. For a good chunk of my life, whenever I felt down, exhausted, or frustrated, Archie would appear to cheer me up and assure me that my work was important. No telling how many other people can say something similar about Archie, the union harbor worker and carpenter who, at mid-life, became a towering folklorist, laborlorist, cultural critic, and advocate/lobbyist for traditional culture. One of those, young Sean Burns, undertakes the daunting task of a biography in Archie Green: The Making of a Working Class Hero. Empowered by extensive first person interviews with Green and with those in his inner circle, Burns proves at his best in placing Archie’s belief system in the context of his childhood, education, work, and times. Burns succeeds brilliantly in showing how Archie’s bold, broad interests and positions are indeed of one cloth. From Burns, for example, we learn how Archie’s steadfast refusal to write for Sing Out!, no matter how strongly Pete Seeger pushed him, comes from his real world experience as a union laborer, appreciation for the music working people liked, and left-wing opposition to the totalitarian impulse of 20th century communism. How to break that pattern….how to diversify power is the big political problem of the day. It becomes compounded because in diverging power out of Washington you also strengthen the hands of the fundamentalists, reactionary groups in American life that as a mantra talk about less government. How you can blend the notion of more government, that is a strong federal power, with the notion of local autonomy and community control is a huge, huge problem for American life. In summarizing Archie’s last half-century, however, keeping up with Archie proves as challenging for Burns the biographer as it was for any of us who knew him in real life. In exploring just the major areas into which Archie threw himself from creating the American Folklife Center to establishing laborlore as a field, the narrative flow breaks up into a number of individual chapters. A student would be unable, after reading these pages, to distill Green’s last 57 years into a simple, chronological paragraph of positions, publications, and achievements.Nonetheless, Burns explanation of how Archie Green came to be Archie Green makes Archie Green: The Making of a Working Class Hero essential reading for anyone interested in folklore, cultural policy, labor history, or any one of a large number of related fields.